Dr. Ma was born in Vancouver, B.C., but moved to the Toronto area at the age of 1 and has lived there ever since. Having had a lifelong passion for animals, her desire to become a veterinarian grew at an early age. She received her Bachelor of Science degree in Zoology at the University of Toronto, followed by a Masters degree in Biology at Queen’s University, studying hamster behavior and reproduction. In 2008, she completed her Doctor of Veterinary Medicine degree from the Ontario Veterinary College in Guelph. Her professional interests include surgery, dentistry, animal behavior, and small mammal medicine. Dr. Ma currently lives in midtown Toronto with her husband Scott, daughter Hazel, and Finnigan, her sweet and loving feline. When not at the clinic, she spends her time listening to music, singing karaoke, bike riding, and chasing after her energetic toddler. She also loves exploring the city and is always in search of the next hiking trail or hidden gem to share with her family. ¡ahora ofrecemos servicios en español! Dr. Villanueva was raised on a farm in Patagonia, Chile, and has always been in contact with animals. Growing up in this environment allowed her to develop a passion for science, environmentalism, medicine and animal welfare. She began her studies at the “Universidad Austral de Chile (Southern University of Chile)”in 2000, and holds a Bachelor of Veterinary Medicine and Biology as well as a Doctor of Veterinary Medicine degree. After coming to Canada, she completed all requirements to obtain her license to practice in North America, so you could say she’s become a doctor twice in her lifetime! Dr. Villanueva is fluent in Spanish, and is happy to discuss pet care with owners in their native language. Pets have always been a part of her life. She grew up with rabbits, hamsters, gerbils, a hedgehog, cats, fish and fostered many others! Currently, she has 2 cats, Nala and Sassy, as well as a beautiful collection of tropical fish. Outside of work, she enjoys gardening, figure skating, camping and traveling. Hi! My name is Jen, but many people call me JB. I grew up on a farm a few hours away before finishing college and coming to Toronto in 2006. I then spent 4 years working at a pet supply store while running my own dog walking business. Spending so much time outside, I often found injured animals that needed help. 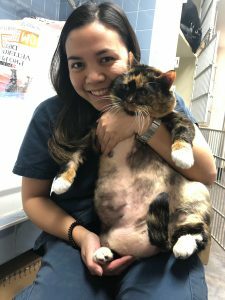 Inspired, I took a wildlife rehabilitation course that ignited my interest in medicine, and was immediately drawn to the Veterinary Technician program at Seneca College. I graduated with honours in 2013 and took my licensing exams to become an RVT, picking up experience at a hospital in Newmarket before finding my home with Wellesley in early 2014. I took over as practice manager in late 2016, and couldn’t be happier to be in a position where I can help both pets and people! Fun Fact: I love space exploration and I’ve been a member of the Planetary Society since 2012; my name is actually in space, on board NASA’s OSIRIS REx vehicle, currently completing a mission to the asteroid Bennu. Heroes: James Herriot, Bill Nye the Science Guy, and Miss Frizzle from the Magic School Bus. Hi there! I’m one of the RVTs here at Wellesley. A native to Toronto, I’ve been with animals as early as I can remember. After I finished my secondary education, I knew I wanted to work with animals. I discovered the wonderful world of Veterinary Technician and have loved every bit of it since. Graduating from Seneca College in early 2016, I was immediately picked up by Wellesley. I got my RVT license in 2017 and love spending my days helping pets and people alike! Pets: A crazy zoo consisting of 2 cats, Max and Juno, and 2 dogs, a German Shepherd named Oscar and a Shepherd mix named Spencer. Fun Fact: I’m the reigning Karaoke Champion of Wellesley, 2 years running. Hello! My name is Kristen, but everyone calls me Kris. I grew up in a large family of seven kids, and even more pets consisting of birds, snakes, cats, dogs, hamsters, fish, ferrets, and even a scorpion! This sparked my interest in wanting to work with animals, so I completed the Animal Care course at Durham College, and that is where I discovered the world of veterinary medicine. I graduated from the Seneca College Veterinary Technician program in 2017, and aside from the wealth of knowledge and experiences I gained there, I also adopted my two adorable kitties Foxy and Vita. I began the next chapter of my life at Wellesley Animal Hospital in the beginning of 2018, and I don’t think I could have found a more perfect fit! I love working alongside such dedicated, enthusiastic, loving individuals who share the same passion for animal welfare as I do! Pets: Two sassy black cats Foxy & Vita, a ball python named Gwar. Fun Facts: I am a horror fanatic who also has a talent for special effects makeup. Heroes: Temple Grandin, Greg Nicotero. Hello, I’m Selene! I started at Wellesley AH as a placement student in 2017 before eventually working with this awesome team, who supported me into becoming a RVT. Like many others in this field, I was surrounded with love from all sorts of animals as a child. Having a grandpa who was a farmer in the Philippines, I grew up with dogs, cats, goats, pigs & rabbits in my backyard! Outside of treating and cuddling pets, I love camping, hiking, attempting to bake, & looking at pictures of our former clinic cat, Nuggy. I look forward to meeting and getting to know everyone’s pets! Fun Facts: I’m as tall and long as a blue whale’s heart! Hello! My name is Amie, and I am a receptionist/assistant/dad-joke-teller at Wellesley. You can usually find me cooing over your cat, or giving your dog belly rubs no matter how wet it was outside. I started out at our sister clinic Front Street Animal Hospital in 2016 after graduating from the Animal Care program at Durham College, and found my family at Wellesley just a few months later. I am also the resident weight loss coach here, helping your chonks shed some pounds and emailing you weigh-in reminders! I surround myself with animals, having two cat-sons at home, and also pet-sitting your fine felines and exotics on the side. On the rare oc casion I’m not petting kitties, I like to play video games (RPGs), listen to music, and watch anime. Pets: Two cat-sons, former clinic cat Todd, and brother Conrad. Fun Facts: I only just watched Lord of the Rings for the first time in December, 2018 and I have been kicking myself since. Hello, my name is Kirstyn! I’m one of the CSRs here at Wellesley, joining the team in mid 2017. I graduated with a BA in Psychology in 2014, and began my journey to find a meaningful career where I could help people. The pieces of the puzzle came together, as I realized that my love for animals, interest in the medical field, and desire to make a difference could be channeled productively by working in an animal hospital. Shortly after, I found the perfect fit at Wellesley, and couldn’t be happier! Fun Fact: Amie and I are actually childhood best friends! Hello, my name is Carissa and I am from Hong Kong! I’ve lived in Toronto since grade 9 and just graduated from the University of Toronto with a double major in Animal Physiology & Ecology and Evolutionary Biology. I have always been interested in animal welfare and have a passion for helping animals. I have worked as a veterinary assistant in Hong Kong, then joined the Wellesley team as a CSR in November 2018. I am also a wildlife rehabilitation intern at the Toronto Wildlife Centre, providing care to more fluff babies (red foxes, coyotes and tons of pigeons!). Fun Facts: I am a professional blanket burrito that speaks both Cantonese and Mandarin. Hello, my name is Kat!! I’m the newest CSR at Wellesley, joining the team in February 2019, and I have a lot of customer service experience. I started my working journey at Tim Hortons for 4 years, moved on to Home Depot for 2 years, then a Rogers Call Center for 2 years, and I have now been in the veterinary field since leaving Rogers (almost 5 years now). I love what I do. I love knowing that even though I am not treating pets medically I do play a part in their experience at the hospital, and I strive to make every visit as pleasant and efficient as possible. Fun Fact: You get two; I am 1 of 7 children, and I used to sing in talent shows. Heroes: Hayley Williams of the band Paramore. Hi, I’m Chiwai! I started with Wellesley in 2015 as a high school placement student firmly set on becoming a veterinarian, have been here ever since! I’m currently working on my undergraduate degree with the aim of moving on to veterinary school. When I’m not at school you can find me here doing everything I can to help animals and gain experience. My love of pets stems from Yo-Yo, a special needs talking cockatiel that delighted me as a kindergartener, and Diamond, a handsome and brave Bichon Frise. Our adventures together arere the stuff of legends! I couldn’t be happier to contribute to Toronto’s pet community and dedicate my life to caring for animals in need. Hi I’m Aishlinn! I’m the ACA here at Wellesley. My love of animals started with a hamster named Chip when I was 6 years old. From then on I was surrounded by animals, running my own pet sitting business and working for a dog daycare throughout my teens and early twenties. Typically you’ll find me in the back, cuddling your animals and crying over their cuteness (literally). When I’m not at Wellesley Animal Hospital I’m studying Advertising and Marketing at Centennial College, or visiting my family overseas.